Go is a board game for two players. The black and white stones are alternatively placed on the vacant intersections of a 19�19 rectilinear gridcrossing playing field. The origin of Go can be traced back to ancient China. In China the game is still called weí qí – game of surrounding and enclosing. The aim of the game is using your stones to surround and control many and large areas of the board, which are called territory. The one who controlls the largest amount of territory is the winner. You can imagine two peasants parcel out a certain area of land. First they plant the fencing posts, there after they put up the fence itself. The one who is more skillful to get a larger area, succeeds over the other. The game of Go is not about to control the whole playing area or to destroy your opponent, but to live in co-excistence with others. You just need to have a little more than the other. Therefore Go requires a well measured fighting spirit. The pure quest for possession does not go along with success. Go is approximately 4000 years old. 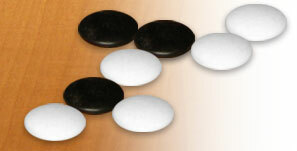 Many of the term used in Go indicate, what the black and white stones have originally been used as a calender and as an instrument for forcasting the future. Later the stones have been used to simulate positions of armies and develop thereon tactics and strategies for the on coming fights and battles. The rules of Go are easy to learn. You need just about half an hour. When you have played the first games (preferable on the small 9x9-board), you will get a first impression of what Go is about. The more you learn about Go, the more exciting it will become.